You have more than 2 bikes? A slot has the duration required for the service of one or two bikes only. If you have more than two bikes, will you please, select two consecutive slots. Please mention us it in the text box when booking. Your postal code is not recognized? If your postal code is not recognized, please email us and we will respond to your request on an individual basis. We will do our best to find a timeslot that meets your needs. You need a complete rebuild? In the case of a complete rebuild of your bike, time exceeds the allotted time for a standard timeslot. So you must reserve two consecutive slots. Please mention it in the text box while booking. Please fill the reservation form thoroughly! When booking, take the time to enter all possible details about your bike in the text box. This allows us to assess the required service and to prepare ourselves properly. 2 Book the time slot of your choice! Bike servicing and repair, wherever you are! All services that you find in a bike shop are now available in a mobile way, at your convenience. 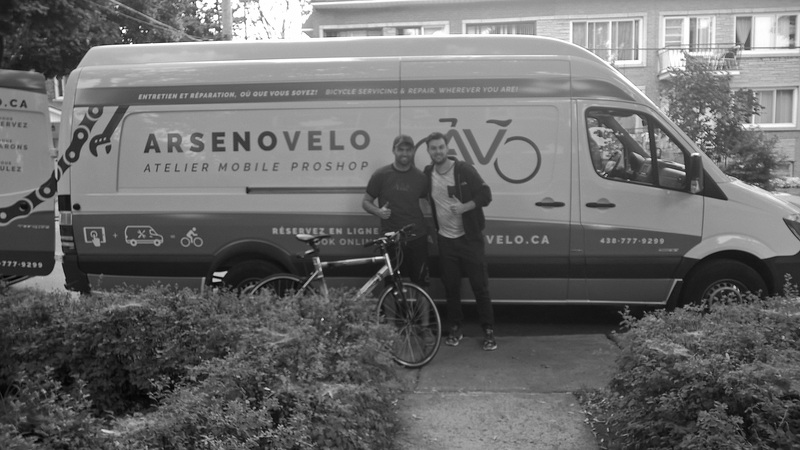 ArsenoVelo can do tune-ups, repairs and reconstruction of all types of bikes. We accept credit (Visa, Mastercard, ect...), debits cards and cash.